NVFF Screens "Woman in Gold"
Ed and I recently attended a Napa Valley Film Festival (NVFF) sneak preview of a terrific film: Woman in Gold, at the Cameo theater--the oldest single-screen theater in the US--in St. Helena, California. The film starred the immensely talented Helen Mirren and Ryan Reynolds and was directed by Simon Curtis (My Life with Marilyn). Mirren stars as the Jewish exile Maria Altmann, who escaped from Austria and likely death in the camps; she sought the restitution of the luminous Gustav Klimt painting--in shimmering gold and oil on canvas--of her aunt Adele Bloch-Bauer, the subject of the painting, and four other Klimt paintings, all looted by the Nazi's in World War II Austria from her family. At the time of the 8-year effort to regain the paintings, the one named "Portrait of Adele Block-Bauer 1" (1907) was considered by many to be Austria's Mona Lisa. Reynolds played her only-32-year-old attorney, E. Randol (Randy) Schoenberg, grandson of Austrian composer Arnold Schoenberg, who himself fled Austria in 1933, and son of Altmann's close friend. Together Altmann and Schoenberg took the claim against the Austrian government all the way to the U.S. Supreme Court, which found in favor of Altmann. The Austrian federal art museum, the Belvedere, where the paintings had been exhibited, returned the paintings to their rightful owner--Altmann. The film was especially poignant for Ed and me as we had attended a showing of the painting "Portrait of Adele Block-Bauer 1" at the Los Angeles County Museum of Art (LACMA) shortly after it was returned to Maria Altmann in 2006. We met both Altmann and Schoenberg there. Although LACMA had so much wanted to acquire the painting, it was purchased by Jewish philanthropist and cosmetics heir Ron Lauder (son of Estee Lauder), for $135 million and hangs in his Neue Galerie in New York City. The other four Klimt paintings were sold at auction for $192.7 million. The combined proceeds for the five paintings were bequethed to her heirs. Altmann passed away in 2011 just after her 95th birthday. What a woman! Prior to the screening, we were treated to some great Freemark Abbey Chardonnay, and afterwards we walked over to Caldwell Snyder for a VIP after-party catered by Meadowood Estate Events. In addition to the 2010 Diamond Mountain District Cabernet Sauvignon we donated, patrons were treated to Alpha Omega, Sullivan, and Paratus wines. An after-after party at Raymond Vineyards was enjoyed by many of the late night revelers. The wonderful evening was a fundraiser to support the NVFF's year-round film education and outreach programs and exemplified what the Festival offers as part of its Patron Circle and year-round programming programs. On Friday night, Access Hollywood's Billy Bush hosted the Napa Valley Celebrity Tributes to recognize the outstanding achievements of established actors and filmmakers, as well as rising stars. The BVisionary award was presented to screen-icon Kevin Costner (who was introduced by his buddy Bill Paxton), and the Domaine Chandon Rising Star award honored Jeremy Jordon. An additional tribute was presented to Michele Monagan. Before each star came on stage, film clips from many of the actors' films were shown. The number of fabulous films that Kevin produced, directed and always acted in was incredible! We had actually seen his most recent wonderful film, Black or White, which he both produced and in which he starred, the night before. He played a successful attorney, who has to fight for custody of his African-American granddaughter after his wife is killed in a car crash. He and his late wife had taken care of the little girl since birth after their daughter dies in childbirth. After the Celebrity Tributes, Ed and I headed over to the etoile restaurant at the winery Domaine Chandon, in Yountville, where patrons of the Festival toasted the honorees at a private dinner. 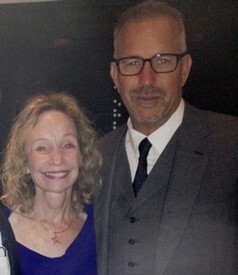 Ed and I were so lucky to be seated next to Kevin Costner and his beautiful wife Christine Baumgartner. Kevin was charming and extremely articulate about subjects diverse as hunting, vegetarianism, drugs, football, family, and film. The dinner of Maine Lobster Bisque, paired with etoile Rose; Braised Short Rib, paired with Domaine Chandon Cabernet Sauvigon, Mt. Veeder 2010; and Honey Olive Cake, paired with Chandon Delice; was terrific too. On November 11, the Napa Valley Film Festival gave Silicon Valley a first look at what the Festival has in store November 12-16, 2014. This preview party was held at the Morgan Estate, in Los Altos Hills, CA, an incredible mansion, that looked like it belonged to an English duke. Festival Founders Brenda and Marc Lhormer presented a preview of the 2014 Festival program and a taste of the Patron Circle experience with rare library wines from Napa and Bordeaux by Benchmark Wine Group, hand-crafted cocktails by Scott Beattie of Meadowood Napa Valley, and mouth-watering cuisine from Estate Events by Meadowood. As a special bonus, filmaker Kelly Cox presented an excerpt from her new film Big Dream, which explores the lives of young women who've been inspired to pursue careers in science, technology, engineering and math. Big Dream will have its world premiere at this year's Festival in November and show in Napa Valley high schools. News Flash: the Festival's Celebrity Tribute honoree will be none other than Kevin Costner, who brings his provocative new film Black and White to screen on Thursday, November 13, and will participate in the post-screening Q&A with director Mike Binder. On Friday, Billy Bush (who MC'd the evening's program), will host a wide-ranging conversation with Kevin avout his career as actor, director, producer. Following the Celebrity Tributes, Patrons will continue the celebration at Jean-Charles Boisset's Raymond Vineyards. Mike Myers is also attending the Festival with Shep Gordon, super talent agent and subject of Mike's hilarious and touching documentary Supermensch: The Legend of Shep Gordon. Also screening at the Festival is The Disappearance of Eleanor Rigby: Her & Him, starring Jessica Chastain and James McAvoy, and Imitation Game, starring Benedict Cumberbatch and Keira Knightley, which just won the Toronto Film Festival Audience Award. Hope to see you at this year's marvelous festival! My husband Ed is one of the executive producers of the wonderful 2011 documentary feature film Jiro Dreams of Sushi, which was directed by David Gelb. It is about the almost 90-year old sushi chef, Jiro Ono, his search for perfection in the making of sushi, and his relationship with his two sons. In fact, Bob Iger, CEO of Disney, uses this film as a mangement tool to motivate his staff. Jiro Dreams of Sushi, which was screened at the 2011 Napa Valley Film Festival, is the film of which Ed is the most proud to have been a part. 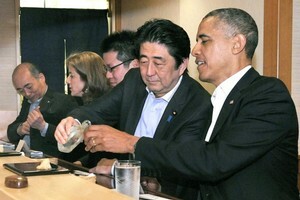 On April 23, 2014, within 90 minutes of landing in Tokyo to meet with Japan's Prime Minister Shinzo Abe, Abe took President Obama to eat at Sukiyabashi Jiro, the only sushi restaurant in the world to be rated with three stars by the Michelin Guide. There are only about 100 restaurants in the world with three Michelin stars and, I'm sure, it took a prime minister to score the reservation there. It is located in a Tokyo subway, has only ten seats, and is extremely popular. There is no menu, one eats what chef/owner Jiro Ono puts in front of him or her, and the meal costs about $300 per person. Although director David Gelb started out to make a movie about several sushi restaurants in Japan, after meeting chef Jiro Ono, felt compelled to do the film about him and his fabulous restaurant. You may stream the film on Amazon Prime Instant Video or on Netflix. At the end of the meal, President Obama told Prime Minister Abe that, even though he had eaten alot of sushi as he came from Hawaii, it was the best sushi he had ever eaten. If you are driven to make a reservation to fly to Tokyo, just know that, it could take at least 3 months to get into Sukiyabashi Jiro, if ever. You may have better luck with the French Laundry! On March 2, the film Twenty Feet From Stardom, which the Napa Valley Film Festival screened in 2013, took home the Academy Award for the best 2013 documentary feature. The film, directed by Emmy award-winning Morgan Neville, tells the untold story of backup singers who have been behind some of the greatest musical legends of our time, such as Elton John, The Rolling Stones, Tina Turner, Sting, Beyonce, Alicia Keyes and Aretha Franklin. The film highlights the careers of backup singers Lisa Fischer, Darlene Love, Judith Hill, and Merry Clayton among others, who, like Darlene Love, either got beat up by an abusive music industry, or who, like Lisa Fischer, made a concerted decision not to seek stardom. Immediately following the 2013 Napa Film Festival screening, we were lucky to have director Neville and Lisa Fischer for a Q&A session and then hear talented Ms. Fischer deliver a stunning impromptu a cappella performance. Check it out here. We also got to meet the delightful Lisa backstage. Actually, the nights right before and right after the screening, she was backing up the Rolling Stones, who were touring California. Ed and I just returned from the Sundance Film Festival, in Park City, Utah. The festival, in its 30th year, screened 118 feature-length films from 37 different countries and 54 first-time filmmakers (from an incredible 12,218 submissions.) We saw some terrific films, like Camp Xray, Whiplash, A Most Wanted Man, Last Days in Vietnam (a documentary), I Origins, Song One, and War Story. There were plenty of Hollywood A-listers making the rounds on Main Steet, like Anne Hathaway, Elizabeth Moss, and Robert de Niro. We were lucky enough to chat with the incredibly talented and beautiful star of War Story, Catherine Keener (see photo), at a dinner at Chef's Dance. 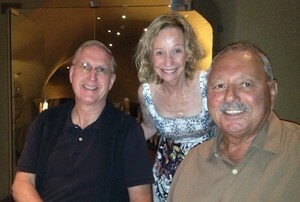 Kevin Iwashina, who represents War Story, invited Ed and me to the dinner given for the cast and crew. In the film, directed by Mark Jackson and written by Mark Jackson and Kristin Gore, Keener plays a war photograher, who retreats to a small town in Sicily after being held captive during the conflict in Libya. We also met Kristin Gore, one of the writers and producers of the film and Al Gore's daughter. We also had the pleasure of meeting American singer, songwriter and composer, Alex Ebert, who won the 2014 Golden Globes for his original score for the film All Is Lost (a gripping 2013 American survival film, starring Robert Redford and written and directed by JC Chandor). Unfortunately, Alex didn't get nominated for an Oscar for his score. What do they know?!? We met Alex (see photo) while taking a break from the films to watch the playoff game between the S.F. '49ers and the Seattle Seahawks. What a close game! Someday, the Napa Valley Film Festival will be as successful as Sundance! On November 15, Ed and I attended the Napa Valley Film Festival Celebrity Dinner at etoile restaurant, at Domanine and Chandon in Yountville, which proceded the Festival's Celebrity Tribute event at the Lincoln Theater, also in Yountville. We were lucky to sit next to the interesting and very approachable director of Saving Mr. Banks, John Lee Hancock. We so much enjoyed our conversation with him about his experiences making the film, which was about the making of another film: Mary Poppins. We also were lucky enough to meet one of the stars of Saving Mr. Banks - - charming Irish actor Colin Farrell. (See photo.) I got to chat with him about his jewelry. 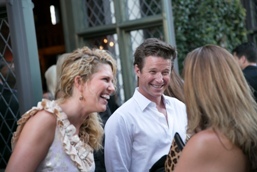 Ed and I attended the V Foundation's 15th annual Wine Celebration August 1-3. The Foundation was founded by Jim Valvano and ESPN to raise money for cancer research. Valvano was the head coach of North Carolina State University's men's basketball team and led it to win the national championship in 1983; in his last days before dying of bone cancer in 1993, he asked that the Foundation be started to find a cure for cancer. On the first night of the Wine Celebration, we attended a lovely dinner hosted by Ann and Chuck McMinn (left) at their wonderful winery Vineyard 29. I was lucky enough to sit next to Jim Valvano's brother Nick Valvano (right), President Emeritus of the V Foundation, who served as its CEO for 13 years (1999-2012), and who has been on its Board since its inception. Nick, also a former basketball player and coach, played guard. We learned alot about Valvano's extraordinary spirit and remarkable impact that week , especially through the dinner and auction at the Nickel and Nickel Winery and through producer Dereck Wittenburg's and director Jonathan Hock's documentary, "Survive and Advance," which was screened at Yountville's Barrel Room by the Napa Valley Film Festival in conjuntion with the V Foundation. The dinner/auction was hosted by Mike Krzyzewski ("Coach K"), head coach of Duke's men's basketball team. He, as well as Bob Lloyd, Chairman of the V Foundation and Valvano's longtime friend and teammate at Rutger's University, both emphasized the challenge we face in fighting cancer. Robin Roberts, Good Morning America co-host, who is battling cancer herself, addressed us through a video feed. The evening was topped off by a concert by Melissa Etheridge, rock singer and Grammy award winner. On July 21, 2013, Ed and I were lucky to be invited to the opening night of "Sideways," the play, at La Jolla Playhouse's Sheila and Hughes Potiker Theater. Our gracious hosts were Brenda and Marc Lhormer, the directors of the film "Bottle Shock," and the founders of the Napa Valley Film Festival. 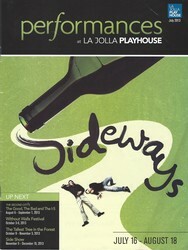 We were totally surprised that the successful 2004 film "Sideways" was made into a hilarious play, which we thoroughly enjoyed. Rex Pickett, the playwright, who we met there, has rewritten his original novel "Sideways" into a play about what ensues when up-tight, wine-afficianato Miles (Patrick Breen), takes his buddy, womanizer Jack (Sean Allan Krill), on a week-long wine-tasting road trip through the Santa Inez Valley, a week before Jack's impending wedding. This stag party/wine tasting on wheels leads to their getting into trouble with the women they meet. I have a feeling that this terrifically funny play will be produced on Broadway. The performance was preceded and followed by a delicious reception, where Jamieson Ranch poured its yummy chardonnay and pinot noir. Bottle Rock Napa Valley and the Napa Valley Film festival teamed up to present two music documentaries: Sound City, at the Uptown Theater, on May 6, and Twenty Feet From Stardom, at 500 First Street (the former Copia facility), on May 7. Sound City, directed by Nirvana/Foo Fighters musician Dave Grohl, was about the history of the legendary recording studio hidden away in Van Nuys, in the San Fernando Valley, near Los Angeles. Sound City Sudios was the birthplace of many of the greatest recordings in rock and roll history, and the film showcases Mick Fleetwood, Stevie Nicks, Tom Petty and Rick Springfield, among others, and shows how Grohl brings the Studio back to life in the digital age. Hors d'ovres by Bouchon and wines by Miner were terrrific! Twenty Feet From Stardom, directed by Morgan Neville, my personal favorite, was first screened at Sundance, where it received standing ovations, and was presented here as a special sneak preview before it opens theatrically in June. The film follows several diverse and gifted backup singers who, although immensely talented, perform in the shadows of star singers, such as Michael Jackson, Patti Austin, Pattie LaBelle, Stevie Wonder, Ray Charles and the Rolling Stones. We learn their names; Darlene Love, Merry Clayton, Lisa Fischer, Tata Vega and Judith Hill, who have sacrificed their egos to be a part of something bigger than themselves, backing up the star. At the conclusion of the screening, Director Neville and Lisa Fisher answered questions from the audience, and then Lisa sang to an enrapt audience. Ed and I were lucky enough to meet Lisa personally backstage. What a lovely and gentle soul she is.